Some people believe the opposable thumb is the secret to humanity’s success. But not me. For me, I think the knowledge of our mortality, of our limited existence, has played a far greater role in advancing us forward as a species. Otherwise, why try? It’s all well and good to be able to use a rock as a tool, but if you’re well fed and happy on a temperate savannah, the impetus to go anywhere else is likely to be rather muted. No, humanity craves legacy, and the best way to ensure true legacy (not just your standard all-too-short fifteen minutes) is to drive progress by inventing something useful or discovering something (or some place) of value. Columbus thought he could revolutionise trade by finding a simple, direct route from Europe to Asia – by going the other way around. Of course, he didn’t, but he ran into the New World, which was some consolation prize! It turns out the Norse had been there first, but they didn’t stay long, and while their voyage was arguably much more difficult than Columbus’s (and for that they certainly earn bonus points) staying power is everything. The Spanish and the Portuguese took the South of these two new “Americas”, and the British and French the North. Their subsequent pioneers and explorers made plenty of discoveries (and names) of their own. But Columbus was by no means a special case – a millennia and a half before, the Romans built roads and marched to (and conquered) virtually every nook and cranny of Europe. The Vikings explored Iceland and Greenland. Marco Polo, while not the first European to get to China was the first to squawk about it, inspiring many other explorers – including Columbus. But none of them would’ve done any of that if those first restless souls hadn’t left the comforts of the savannah. It’s not all about the destination though, as fantastical as some of those (the top of Everest, the South Pole, the depths of the Mariana Trench) may be, but how we got there is arguably of equal or greater import. Without the innovations which led to sailing vessels capable of crossing the Atlantic, of trains steaming across the plains of North America, or the aircraft which shrunk the travel time to exotic locales from weeks to hours, much of those accomplishments may not have happened. Speaking of aircraft, it was a mere 66 years between Kitty Hawk and “one small step for man”, from the first powered flight to leave the ground in any capacity to flying to the Moon. That’s an extraordinary achievement – perhaps _the_ most extraordinary achievement – by any measure. But while those men who set foot on the lunar surface were perhaps the greatest of humanity’s explorers, there’s no way they could’ve got there without a vast amount of preceding innovation and ingenuity. Firstly, the Earth doesn’t generally want to let you leave. Gravity and a modest amount of thrust work together with an aircraft wing to cause lift and keep a plane in the air, but travelling straight up requires more thrust – much, much more. You need a rocket for that. But it’s not a simple matter of filling a tube full of fuel and lighting a fuse – something of the size required to break free of the Earth’s gravity has to be stable, especially during liftoff, or it’s more likely to go where you don’t want it to go (frequently the ground) than where you do. All you end up with for all of that time and money spent is a very expensive debris field. Secondly, once you get out into space, you have to deal with the fact that it’s space – no atmosphere, extremes of heat and cold, radiation, meteorites. Assuming you figure out how to survive all of those, you can romp around a bit, but don’t think you can play hooky on old Mother Earth and walk back through that kitchen door for supper when you’re done! No sir (or ma’am.) She don’t want you back – she’ll set you on fire if you try. Unless you do it just the right way. So, once you’ve worked out how to get up there, take a spin around a few rotations, maybe take a walk outside and return safely back down, you begin to get designs on that disc that has a habit of dominating the night sky, taunting, beckoning to you like a mythical Siren. And you start to believe that it’s possible – after all, once you’re up there, all you have to do is build up a head of steam and point yourself in the right direction. It’s a simple matter, isn’t it? Just engineer a tin can a few people can survive in for a few days and off we go! Easy-peasy. Except it’s not – especially not if you want your odds of survival to reach above the single digits. There’s literally a million things that could go wrong, and millions of taxpayer dollars to be wasted if things don’t go exactly as planned. Precise calculations need to be made, taking into account hundreds of variables – if even a single one of those is incorrect you could end up taking a wrong turn in space and ending up someplace far less hospitable than Albuquerque. It’s not a good look when your astronauts die slowly, running out of oxygen, or roasting or freezing to death! 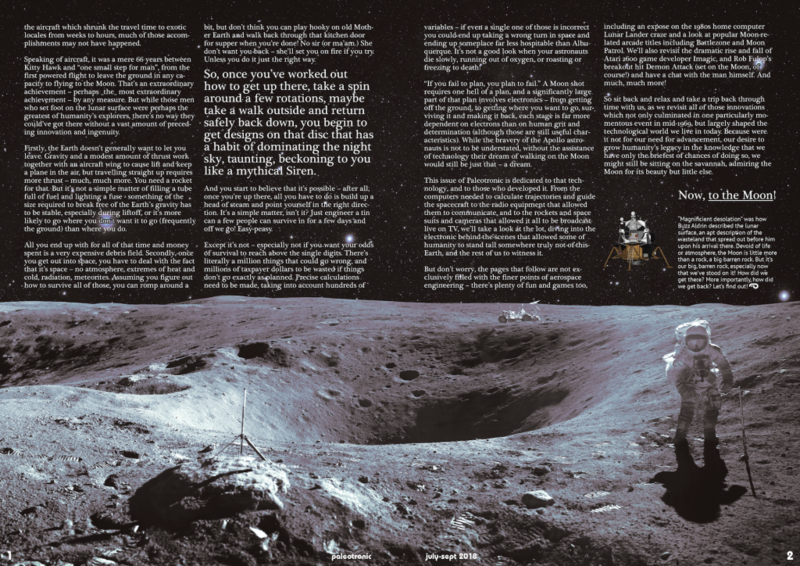 “If you fail to plan, you plan to fail.” A Moon shot requires one hell of a plan, and a significantly large part of that plan involves electronics – from getting off the ground, to getting where you want to go, surviving it and making it back, each stage is far more dependent on electrons than on human grit and determination (although those are still useful characteristics). While the bravery of the Apollo astronauts is not to be understated, without the assistance of technology their dream of walking on the Moon would still be just that – a dream. 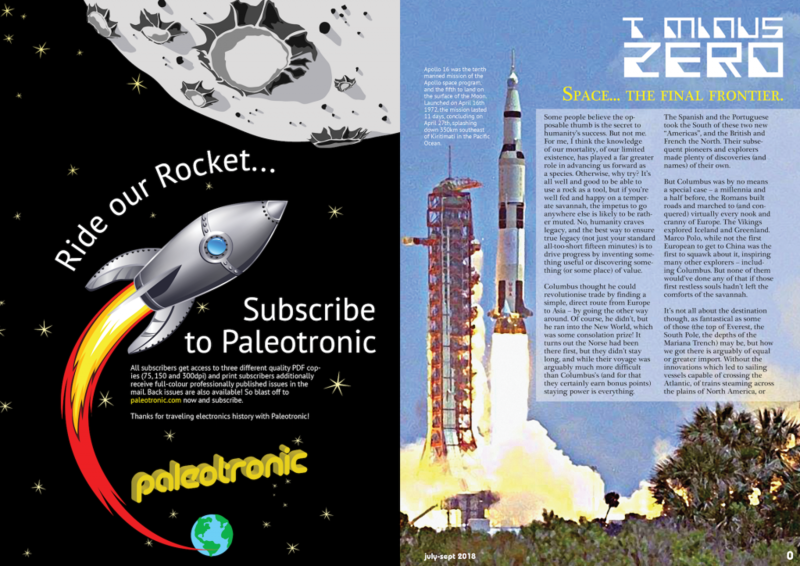 This issue of Paleotronic is dedicated to that technology, and to those who developed it. From the computers needed to calculate trajectories and guide the spacecraft to the radio equipment that allowed them to communicate, and to the rockets and space suits and cameras that allowed it all to be broadcast live on TV, we’ll take a look at the lot, diving into the electronic behind-the-scenes that allowed some of humanity to stand tall somewhere truly not-of-this-Earth, and the rest of us to witness it. 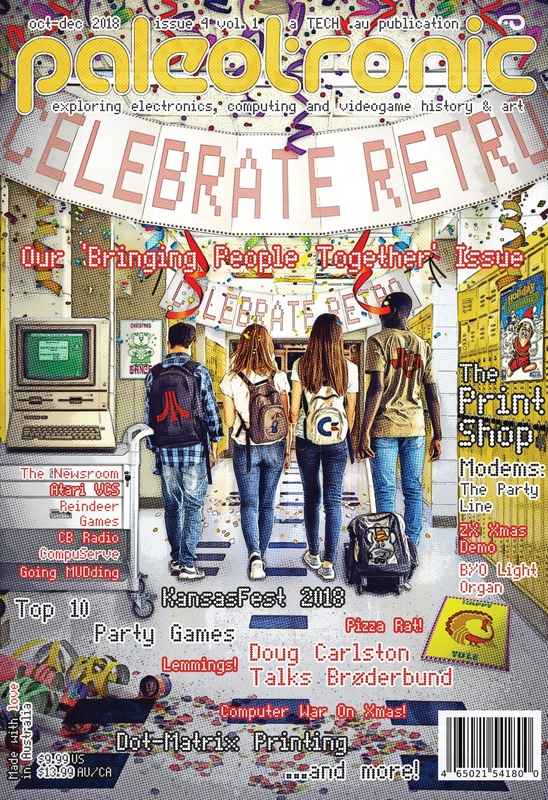 But don’t worry, the pages that follow are not exclusively filled with the finer points of aerospace engineering – there’s plenty of fun and games too, including an expose on the 1980s home computer Lunar Lander craze and a look at popular Moon-related arcade titles including Battlezone and Moon Patrol. We’ll also revisit the dramatic rise and fall of Atari 2600 game developer Imagic, and Rob Fulop’s breakout hit Demon Attack (set on the Moon, of course!) and have a chat with the man himself. And much, much more! So sit back and relax and take a trip back through time with us, as we revisit all of those innovations which not only culminated in one particularly momentous event in mid-1969, but largely shaped the technological world we live in today. Because were it not for our need for advancement, our desire to grow humanity’s legacy in the knowledge that we have only the briefest of chances of doing so, we might still be sitting on the savannah, admiring the Moon for its beauty but little else.